A busy weekend up here at Tunkwa with all the guest having a good time. Fridays warm weather and strong winds really melted a lot of our snow, and left the lake ice top bare, and slippery. Nightime temps really dropped, hardening things back up.Ice thickness is staying consistent at around 14″, plenty thick and safe for quads or sleds. Mixed fishing reports, some guest having no luck, but some doing really well. Some good catches coming out of some really shallow water, 2′!!! Some had better luck with shrimp, while others got them on worms. Fishing a Tunkwa rig(spoon with jig dropper), to call the trout in really ups ones success rate. 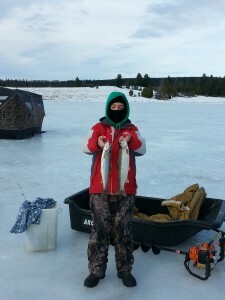 Tyler Willis with a couple of nice trout, taken just before the Superbowl kick off!